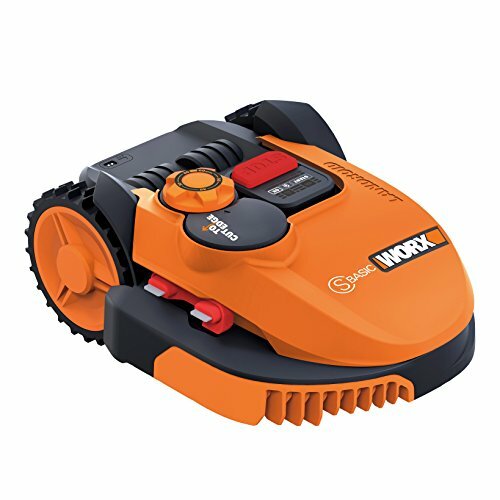 Today i’m looking at one of the more popular models of robotic mower for the smaller garden the Worx WR090S S300. Until now the majority of robot mowers have been built to deal with pretty large gardens. This is great if you are looking to replace a ride on mower but they don’t really cater for the majority of British users that have modest sized gardens at best. It is really easy to be impressed by the scale of some of the larger sized models but what about the convenience of having it in a new build house. The reason many of us buy modern houses is for convenience and minimal up keep. Well, add a robot mower to the garden and up keep is even less. The Worx WR090S is perfect for keeping a small lawn in perfect condition. The WR090S can deal with lawns up to 300 meters square. This is moderate sized lawn that will take probably 20 to 40 minutes to cut with a conventional mower. The Worx will go out automatically everyday and cut the grass keeping it super tidy with no mess what so ever. If you have a busy family life or work away this is brilliant news. The price of this model is pretty competitive as well. Any decent petrol push along mower is going to cost anything from £100 to £250, at around £500 this model is great value. For that little extra you will save many hours of mowing. So let’s have a look at the features the Worx WR090S S300 offers. Standard for all robot mowers but still one of the best features. As the mower runs every day it shaves millimetres off the grass everyday which settles at the bottom of the lawn. There are no clippings to pick up and put on a messy compost heap. These clippings also feed the lawn as they rot away on the ground. Another added bonus! No more gas gusling petrol mowers that add to our already polluted environment and no more noise pollution from a noisy petrol mower engine. The WR090S uses a small battery and very little power to get around the garden. My mower runs over night so that the lawn is perfect every morning. I can’t hear it in the house at all so it doesn’t interrupt any precious time in the garden. This model does not require any programming at all. Once it is set up it will run every day on it’s own program. Once the perimeter wire is pegged down it is pretty much plug and plug. The perimeter wire on a three hundred metre square garden will take around an hour and a half to set up if the shape of you lawn is fairly simple with not too many obstacles to navigate. One thing to bare in mind is that that the base station needs a firm flat surface to sit on. I found this out after i installed mine, which took a while to correct! You are going to need a plug near to the base station. The cable is pretty long but I have had to add an extension lead to reach mine. Not a major problem for most of us especially if you can put the base station close to the house. This is a great feature. I usually start the year cutting at about 60mm in late February and then move the height down by 10mm per week until i get to the desired height. If you like a really short and tidy lawn you can keep it very short. I usually stay at around 30mm as we have a few lumps and bumps in our lawn. Now, this has it’s ups and downs. The majority of the time the mower drives straight onto the base station and charges without a fuss. But, on the odd occasion the mower has slightly missed the two charging bars and I have manually had to move it. This is not a major problem and the advantages of having an easy to position base station far outweigh the down sides. My previous mower had a front charging system which worked well but it was a lot stricter in the position of the base station. The Worx can cut inclines of up to 35% gradient. If you have sections of lawn that are this steep you will know how difficult it is to push a conventional mower up and down the slope. Let the robot mower take care of it for you. While it is raining and for a period of time after the Worx Robotic Mower will not cut the lawn. It will stay on the base station and until the sensor gives the all clear that the rain has stopped. The software will take care of all of this, no human intervention is needed. The general feel for most comments are that the mower cuts the lawn once set up and doesn’t need to be touched. Which is exactly why we purchase them in the first place! One owner has commented on the ease and speed of set up. Very pleased as it does exactly what it says and has caused no issues. Dealing with a bumpy lawn is important and a number of comments have been made about the Worx WR090S S300 ability to deal bumps and surfaces that are not perfectly smooth. On the very slight downside there is a comment about having to re adjust the boundary wire after installation to get the edge cutting correct. I suppose this is going to come down to personal preference and how much of a perfectionist you are about your garden. Summing up this model, I would say this is the perfect balance of all of the key benefits of owning a robot mower along with a realistic price tag for most home owners out there. Most of us wouldn’t consider spending £1,000 plus on a mower which makes this a real option over the more expensive predecessors. More and more robotic mowers that are designed for town houses and city living are coming on to the market and this one is perfectly placed. Worx have a track record of building great robot mowers with many fantastic reviews. This welcome addition to the Worx family comes highly recommended by us.